"60 lbs. lost makes my biggest dream come true"
May 15, 2011, 33 year old mother of 3, Shantel Springer, modeled down the stage at the Hollywood Center for Performing Art with hope to be crowned “Ms. Runway”. Although Shantel didn’t win the title, she won the biggest reward, a chance to live out one of her biggest dreams. Shantel struggled with obesity from a very small child until her young adult years. Years of poor eating habits caught up with Shantel in 2008. At the age of 30, she was diagnosed with Gall Bladder disease and Pre-Diabetes. “I made a vow to myself that I would not let food take me out. I never abused any type of drugs or alcohol; but I finally realized food became my drug of choice. For so many years I struggled with body image and the overwhelming desire to be thin. After some soul searching and reflecting I went through a mental transformation as well as physical. I started seeing myself differently, even with the excess weight. I use to stand in the mirror and look at all of my imperfections; once I stopped focusing on what was wrong with me and started focusing on what I really wanted, which was to be healthy and to get in great physical shape. Something magical took place. I started feeling better about myself, which encouraged me to want to take better care of myself. This is where the huge “Aha” moment took place. I needed to embrace and love myself at 215 lbs. before I could attempt to lose the weight. I beat myself up over the weight for so long, which led me down a path of destruction with overeating and low self esteem. I decided to think differently about myself, and see myself as being healthy and vibrant.” Shantel transformed her mind which transformed her body. She went from a size 18 to a size 7. 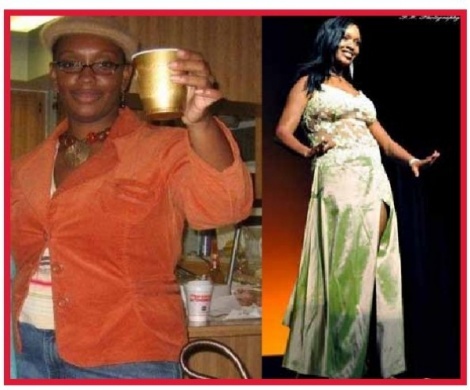 Shantel lost the weight with the help of a Health Coach who taught her the habits of healthy living. She celebrates her 2 year weight loss anniversary this summer. Always being told, if you lose the weight you will make a great model. She did just that, she entered into the Ms. Runway competition hosted by First Class Productions and modeled down the runway with her head held high and a smile so bright it illuminated the auditorium. “This pageant was just the thing I needed to celebrate my weight loss. I can’t remember a time I wore swim wear without being covered from head to toe; but I did it, I walked on that stage in my Baywatch look and strutted down the runway with pride.” Shantel was so inspired by her weight loss; she now pays it forward and is helping individuals all over the country create healthy minds, bodies, and spirits. “I am so grateful for the journey I’m on. I realize my weight was indeed my invitation to live my best life. It has turned into the ultimate “gift”. Jane LynchOrganic: Still a Small Slice of the PiePower Foods For Busy People!Sports in the 2000’s? Better Get it Done Now!